The SAFE Systems MSH 4-24-2 is a high capacity, low profile blast and recovery system that is compact enough to be easily transported down the highway on a double drop trailer. With a few quick and simple steps once the system is at the job site, it is ready to operate. Lift eyes and forklift tubes are both provided for maximum flexibility in handling. 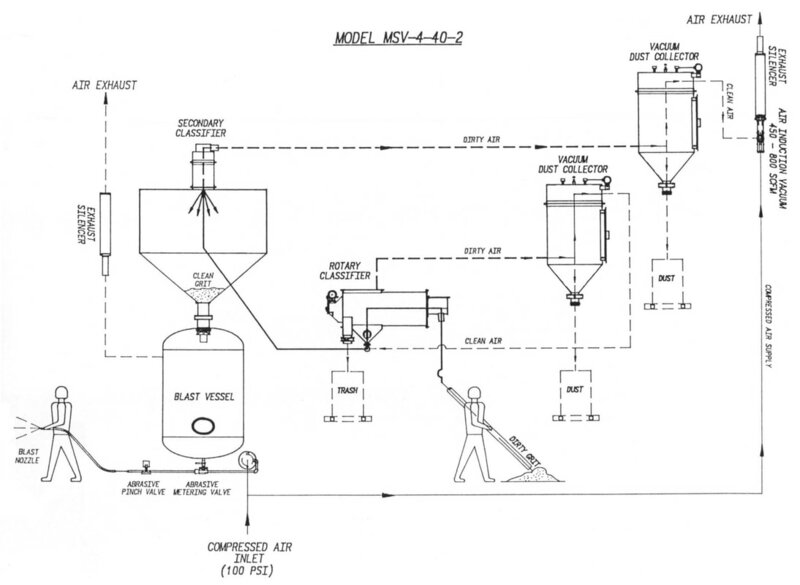 Consisting of an induction vacuum, two classifiers (separators), a storage hopper, a four outlet blast machine and two vacuum dust collectors, the unit makes a compact, highly effective, yet simple blast and recovery system. With a total storage capacity of 24 tons of steel grit abrasive, the system was designed for the blast and recovery of steel grit abrasive but can be modified for use with non-metallic abrasive. Equipped with an air induction vacuum to produce the vacuum for the recovery process, the system is most efficient when used in conjunction with any of our SAFE Systems' vacuum systems (PD 2400-E or D or PD 2100-E or D). Other vacuum producers may work with the unit. 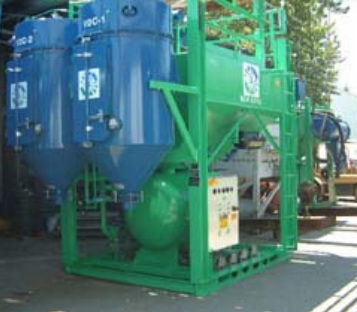 The system's two classifiers consist of a rotary drum (which removes large debris and airborne dust) and a fountain separator (which removes dust and un-usable fines from the recovered abrasive). The cleaned abrasive is returned to the storage hopper and then fed to the blast machine for reuse. The cleaning process takes place while the abrasive is under vacuum, eliminating a lot of extra equipment. After going through the classifiers, the air stream is cleaned of contaminants in the two vacuum dust collectors so only clean air is discharged into the atmosphere. 24 tons of abrasive capacity (steel grit). System can be used with alternate vacuum system(s). Not intended to be shipped with any abrasive or dust/trash in the system. Recommend emptying dust and trash every 2 to 4 hours depending on collection rate.